In planning my wedding reception, I discovered a wonderfully enchanting venue called Limestone Bay Trading Co. in the historic Mooresville, Alabama. Tucked away in a quiet spot off of the highway, sat the tiny, unforgotten old trading company, chockfull of vintage charm. Shelves full of old-fashioned kitchen tools don the walls, classic cameras hang right above a stained-glass window, and homemade jams and jellies stand at attention behind a vintage register. As charming as the venue might be, there is one priority for the reception dinner. The food must be wonderful. So, the owner, Dee, brought out a few sides for us to pick at while hashing out the details of the event: flowers, vases, and menu items… that’s about the time my fork dove into the broccoli salad. The broccoli salad. In mere moments, I became completely distracted from the most important day of my life and began dissecting what was in this simple and elegant salad. Sweet, crunchy, creamy… Dee, while excusing herself to get a cup of coffee, asked if anyone needed anything. I looked at her with the most pathetic eyes and stared at my empty dish. “I’ll get you some more broccoli salad,” she said. Life instantly got better. The big day went off without a hitch. When sitting down at the wedding reception dinner, Dee offered to make my plate, and within moments, a whole plate filled with red wine infused beef brisket, dreamy creamed corn and crispy cornbread arrived in front of my beaming face, along with an entire plate full of my beloved broccoli salad. Thanks, Dee. 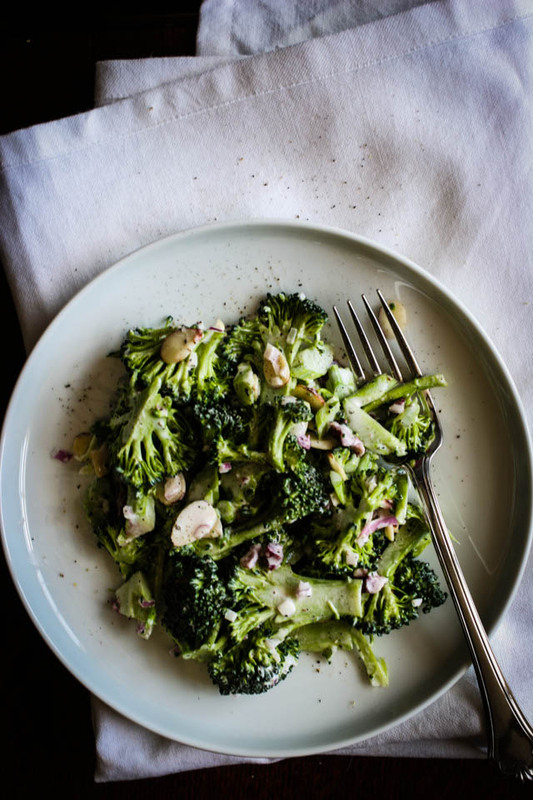 Deb Perelman highlights a sensational broccoli salad in her new book The Smitten Kitchen Cookbook. In the original recipe, Deb uses raw onions, but I substituted the onions for shallots (I’m not a huge fan of eating raw onion.) Also, running the chopped shallots under cold water for a few seconds mellows out the oniony bite even more. In a small bowl, whisk the buttermilk, mayonnaise, vinegar, sugar and salt until smooth. Stir in the shallot. Allow the shallot to mellow out in the dressing for 10 minutes. Meanwhile, trim the broccoli, and chop it into large chunks. Then cut chunks into thin slices (you could do the slicing with a mandoline, just watch your fingers!) Toss the broccoli with almonds and cranberries. 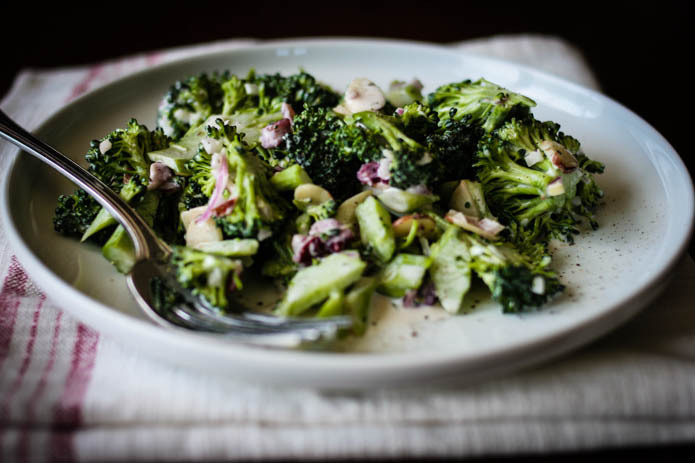 Pour the dressing over the broccoli mixture, and add a generous amount of freshly cracked black pepper. Stir the salad until all of the components have been evenly coated. This salad can be served immediately or lasts 3 days in the fridge. I’ve made this from the SK cookbook before, and it is to die for! So yummy! I am falling in love with her cookbook , and this recipe is one of my favorites! Oh yes, I made the SK Broccoli Salad recipe earlier this year, and I’ve been obsessed with it ever since. I like sub Greek yogurt for some of the mayo, and I use shallots like you, too. I’ve made it countless times since I discovered it….IT IS SO GOOD!!! Agreed! Deb did a great job finding the perfect broccoli salad recipe! I’m a Southern gal though, so I’m partial to using Duke’s mayo for the recipe. do you cook the broccoli at all or just use it raw? Yes, the broccoli is raw in this recipe!